Pecan Pie was my first pie love. It was the first kind of pie that I ever ate. My mom has always love nuts. Any of them. So if she’s in front of a dessert table she’ll pick anything with nuts in it or on it before anything with fruits. That’s why I started to eat pecan pie since I was a little girl, conditioned by my mother’s taste. I have tasted many bad pecan pies. There’s nothing sadder than a bad pecan pie. I have tasted many of them, searching for that flavor I have in my happy memories. But instead I have encountered so many bland, insipid and one-dimensional pies. Those that after eating them you realized they were not worth the calories! That’s why I always like to play up with the flavors I add to my pecan pies when making it as the perfect Thanksgiving dessert. I have made bourbon, chocolate and with a pumpkin base, as in a Pumpkin and Pecan Pie mash up. For this year though I wanted to enhance the warm spicy notes on pecans, that’s why I went with a Cinnamon and Ginger Pecan Pie. And since I don’t like to use corn syrup I used condensed milk and maple syrup. Now, imagine all this flavors over a piecrust. The result is a warm pie. The gingery notes hit at the end with that hot but floral heat. And the crust, well, it’s my favorite! I’m linking to my Pie Guide so you can take the recipe for it and also read more about how to make these pretty pie decorations for the top. 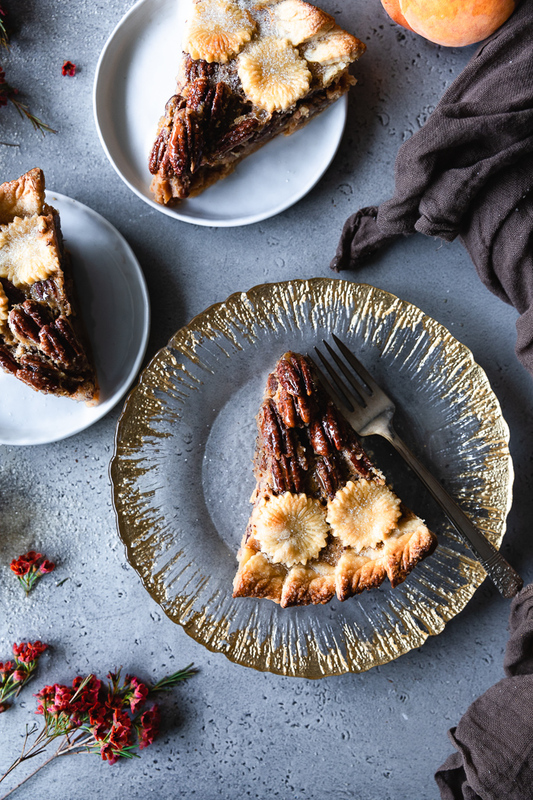 This Pecan Pie would be another beautiful addition to any Thanksgiving dessert table. 1. Here’s the link to my Pretty Pie Guide with the piecrust recipe and lots of tips and cues to create beautiful pie decorations with just a piecrust cutter. 2. If you don't want to create the design with pecans on top just use 2 ½ cups of pecans and roughly chopped them. 3. If you are in a rush and need room temperature eggs fast, place them in a bowl and fill it with very hot tap water. Wait about five minute before using them on your recipe. To make the Pecan Pie: Preheat oven to 400°. Place the already stretched piecrust on your pan and fit it in. Place your weigh in the center. I love my silicone and metal pie weight but you can use some pie weights beads or beans. Bake for 10 minutes and then take it out of the oven. Roughly chop 2 cups of the pecans and toast them in a skillet over medium high heat for 1 to 2 minutes, tossing frequently, until they are fragrant and slightly darker. Place them in a bowl and toast the rest of the pecans for 1 to 2 minutes as well. Set aside. In a medium saucepan heat the milk with the maple syrup, sugar, ginger and flour and bring to a soft boil while whisking frequently with a hand whisk. Cook for 2 to 3 minutes, until the sugar has dissolved into the milk. Retire from heat and stir in the vanilla, the salt and the cinnamon. Beat the eggs and pour some of the milk and sugar mixture into them, whisking constantly. Repeat this a couple of times more, until the eggs are warm. Pour the eggs back into the milk sugar mixture, whisking constantly and fast to prevent curdling. Pour everything into the chopped pecans and mix well. Pour pecan mixture in the piecrust. Decorate the top of the pie. Place in the freezer for 15 to 20 minutes. Remove from freezer and using a pastry brush paint the top crust with the egg wash. Sprinkle a good amount of raw sugar over the crust. Cover the edges with aluminum foil or a pie shield. Place in the oven and drop the oven heat to 350°. Bake for 30 minutes, removing the foil during the last 10 to 7 minutes to get the top decorations golden brown. Take out of the oven and let it cool for some minutes before slicing.